Closing parts of the ocean to fishing to preserve fish stocks holds great intuitive appeal. Similar resource management tools have been used as far back as the Middle Ages, when European kings and princes controlled access to forests and streams, and the fish and wildlife in them. In Hawaii, local chiefs established and maintained networks of no-fishing “kapu” zones, with violations punishable by death. Today, Marine Protected Areas, or MPAs—areas of the ocean temporarily or permanently closed to harvesting—are being proposed to restrict not only fishing, but also mineral and hydrocarbon extraction, and other activities. Some advocates of MPAs suggest that at least 20 percent of the coastal and open ocean should be set aside and permanently zoned to protect ecosystems, sustain fish stocks, and reduce conflicts between users of the oceans. But the key question remains: Do MPAs really work? It is the modern incarnation of a longstanding question: How can we best ensure sustainable fisheries? The debate culminated in one of the first documented experiments to determine the effects of fishing. In 1886, one bay in Scotland remained open while another was closed to fishing for 10 years. The focus of the experiment was plaice, a valuable commercial fish. Over the decade, plaice in the closed bay increased significantly compared to plaice in the open bay. It was an early, instructive demonstration that fishing does have impacts on fish populations, and that regulation is effective for conservation. Since then, seasonal and longer-term closures have been an important fishery management tool, and they have protected spawning fish and nursery areas, preserved vulnerable habitats, and reduced fishing pressure. But by themselves, MPAs cannot attain all of today’s fishery management objectives. And they can create unintended consequences. Preventing harvesting in some areas, for example, inevitably results in people fishing in other, perhaps more vulnerable, locations. MPAs have now been established throughout the world ocean, from the tropics to the poles. Most are relatively small. Many are neither adequately enforced nor monitored to determine their effectiveness. Of those that have been scientifically monitored, many are in tropical and sub-tropical areas. Fish in these regions live most of their lives in specific habitats, such as reef structures, and don’t stray from them. Their fidelity to a small territory is an important part of the potential success of their marine reserve. Populations do increase in such reserves, and some studies suggest a spillover effect from the reserve that augments fisheries nearby. By contrast, in temperate, boreal, and subarctic systems—where most of the major world fisheries reside—many fish populations are wide-ranging and often exhibit extensive seasonal migrations. Can a reserve by itself be a successful fishery management tool for these fish? In 1994, federal regulations established a number of year-round fishery closures on Georges Bank and adjacent areas. This shallow bank has sustained fisheries of legendary abundance for hundreds of years until the mid-20th century, when the heavily fished stocks declined steeply. The year-round closures evolved from seasonal closures established in the 1970s by the International Commission for Northwest Atlantic Fisheries to protect spawning groundfish, particularly haddock. The current year-round closed areas—on Georges Bank and two nearby areas—encompass more than 20,000 square kilometers. It is one of the largest systems of closed fishing areas now in effect. In addition, a mosaic of seasonally closed areas in the Gulf of Maine eliminates fishing in virtually all parts of the gulf at one time or another. At the same time, the National Oceanic and Atmospheric Administration also restricted the number days at sea that fishermen could fish. Fishing by trawlers declined by more than 40 percent over the next five years, although fishing with static gear, such as lobster traps, gillnets and longlines, and limited scallop harvesting, is still allowed in the closed areas. We have several ways to assess the Georges Bank and nearby MPAs. We have monitored fish and shellfish populations to get detailed comparisons of abundances and sizes of animals within and outside the closures, both before and after the establishment of the MPAs. Together with information from the commercial fishery and from scientific studies, the results let us see the impacts of the closed areas on seafloor organisms and communities, on the physical structure of the habitat, and on population levels of fish and shellfish species. The biomass (total population weight) of a number of commercially important fish species on Georges Bank has sharply increased, due to both an increase in the average size of individuals and, for some species, an increase in the number of young surviving to harvestable size. Some non-commercial species, such as longhorn sculpin, increased in biomass. By 2001, haddock populations rebounded dramatically with a fivefold increase. Yellowtail flounder populations have increased by more than 800 percent since the establishment of year-round closures. Cod biomass increased by about 50 percent by 2001. Scallop biomass increased 14-fold by 2001, an extra benefit of the establishment of closed areas primarily intended to protect groundfish. Despite increases in biomass, MPAs only benefit a fishery if fish eggs and larvae are exported from closed areas to replenish open, harvested areas, and/or if some harvestable-size stock “spills over,” moving from closed to open areas to be caught. But if fish at any age leave closed areas at high rates, it will prevent a buildup within the reserve and cancel out any positive effects from the MPA. Estimating the export of eggs and larvae is extremely difficult. But we can use the location of spawning aggregations and hydrodynamic models to estimate the magnitudes and directions of eggs and larvae dispersal. On Georges Bank, a key factor in larval dispersal is a well-established clockwise circulation pattern, or gyre, resulting from factors including local tidal forces and seafloor topography. The gyre creates a conduit that may allow eggs and larvae to self-seed closed areas, cross-seed other closed areas, and transport larvae to open areas. Our analyses for scallop larvae indicate that the closed areas on Georges Bank can be self-sustaining and also contribute to recruitment into other areas. Our initial findings on spillover amounts show that the MPAs have benefited fisheries for some species, but not all. Using information from the commercial fishing fleet, we found significant spillover for haddock and for yellowtail and winter flounders near some closed areas, but no spillover for other commercially important species. But the commercial fleet clearly expects spillover from the MPAs. Satellite tracking shows that large trawlers concentrate their fishing efforts on the borders of the closed areas, poised to pounce on any fish that strays over the boundaries. Scientists from the Northeast Fisheries Science Center, University of Rhode Island, and the U.S. Geological Survey have documented the impacts of mobile fishing gear, such as bottom trawls and dredges, on bottom-living (benthic) communities of organisms. 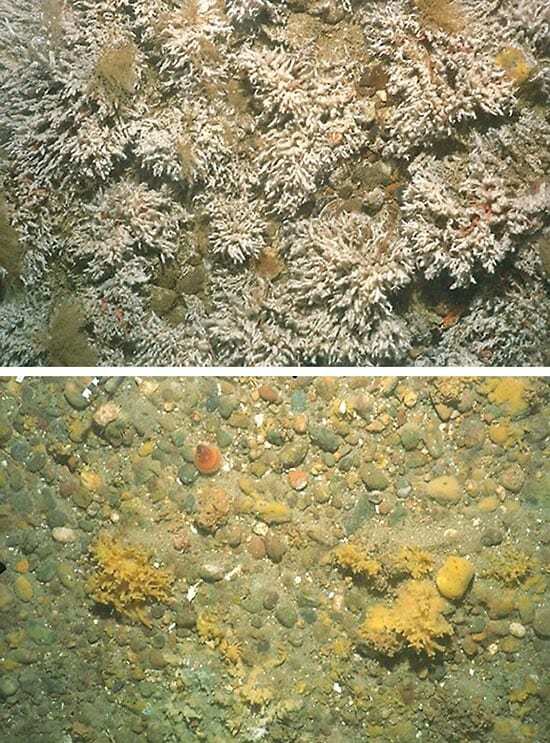 Comparing detailed photographic images of sites inside and outside the Georges Bank closed areas, they have measured the damage done to the seafloor. The difference is striking: We can see the recovery of benthic organisms inside the closed areas and watch community structure re-emerge, as a result of the MPA. establish undisturbed locations for scientific studies that can further improve resource management and conservation. To make the best use of MPAs, though, we have to clearly specify our objectives. We then must evaluate the effectiveness and the social and economic impacts of MPAs and compare the utility of MPAs with other possible management tools to see if they are the best option for the situation. The Georges Bank experience has proven very instructive in how to implement and evaluate marine protected areas in temperate seas—and the experiment is still going strong.